Serious Q: What's the Best Type of Alarm to Wake Up To? There are a lot of things you learn to put up with when you're in a long-term relationship. Maybe your partner snores so loud they could guide ships through the wharf. Maybe they scrape their fork so loudly on their plate that the very thought of them eating sends shivers down your spine. For me, one of the most eye-opening annoyances has been my boyfriend's morning wake-up ringtone. He uses the abort-mission "alarm" sound that's programmed in an iPhone—you know, the one where if you don't turn it off, there's a high probability your phone might blow up? He gets up much earlier than I do, so somehow, my body has become immune to it, but on mornings when we're synched, I'm five seconds away from throwing his phone out the window. I met someone else recently who told me she uses the same god-forsaken blaring alarm to get up in the morning because it's "the only sound that works" for her. At first, I had to tell her my theory that only sociopaths employ this sound, my boyfriend perhaps being coupled in this category, but she seems very normal and stable, so maybe this is just a thing. Wake-up alarms are highly personal, and what works for some may be triggering for others. Personally, and because every ringtone seems off-putting, I've arbitrarily chosen to wake up to iPhone's "radar," a generic vibrating ring sound, but this tone probably wouldn't make my boyfriend flinch. When it does sound in the morning, though, my skin crawls. And forget about hearing it outside the bedroom—it's been conditioned in my brain to be a massive annoyance that jolts me from my peaceful slumber, so I immediately wince and retract when I hear "radar" in the wild. Thus, every morning that I smack my fingers down on my phone to shut off my alarm as fast and painlessly as possible, or any time I hear my boyfriend's alarm and think enemy vessels are about to attack our ship, I wonder: There has to be a sound that's actually pleasant to wake up to. Perhaps there's even science behind the most optimal wake-up sound. Desperate for a better start to my mornings, I reached out to two sleep experts for their recommendations. Let's Get Right to It: What's the Best Sound to Ease You Out of Your Deep Sleep? Birds chirping? The soft strum of a harp? Michael B. Jordan telling you what a strong, beautiful woman you are? Maybe all three, but from a sleep-specialist standpoint, both experts agree there's a common denominator: an alarm with a calm, gradual sound increase is best. 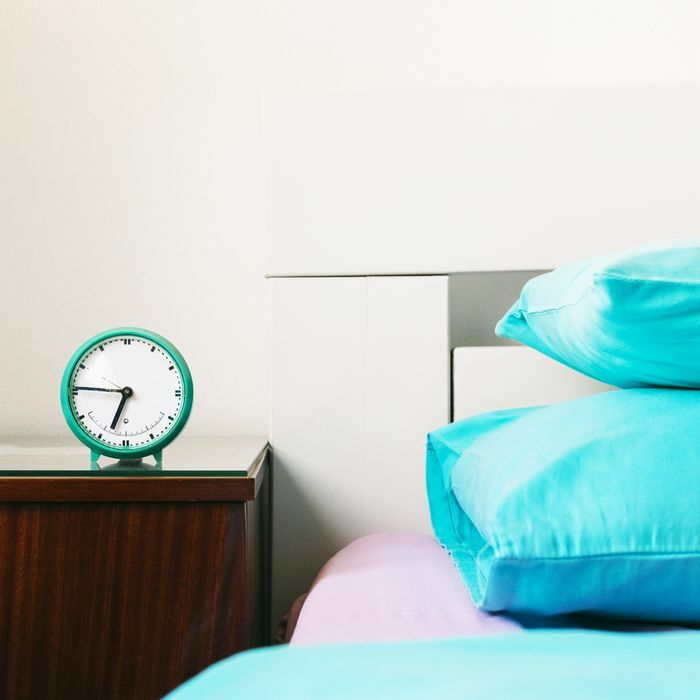 Adam Tishman, co-founder at Helix Sleep, says this way, you can "give your body a chance to wake up naturally rather than be jolted awake by a sudden, loud alarm." Tishman adds that a sudden blast of noise can give you "sleep anxiety," wherein you're prevented from falling into a deep sleep because you're worried about being jolted awake when your alarm sounds. Shilpi Agarwal, MD, board-certified physician and author of The 10-Day Total Body Transformation, agrees. "I think a blaring, loud alarm is really annoying, and sometimes it causes irritability. I would suggest something louder but also calming/relaxing, like a chime or bell." What About Hitting the Snooze Button? Deep down, we know that hitting snooze is counterproductive, but when your bed feels like a womb, it's hard to peel yourself out. Agarwal confirms, though, that we really should take a one-and-done method to our alarms. She explains, "If you find that every day you are hitting snooze, examine why. Is it because you actually don't need to get up at 6:45 a.m., so you just wanted to get your body out of deep sleep? Or is it that you are so exhausted that you just can't make it out of bed? If you find that every day you sleep for 15 more minutes and are more rested, then simply set your alarm five minutes closer to that 'naturally awake' time. I also really like to use the Sleep Cycle app because it is cool in that it gauges your movement and wakes you up when you are in light stages of sleep so you don't feel as tired (in theory). I have used it a lot in the past and determined what time my body should actually wake up. You can use this to determine your 'ideal' wake-up time and adjust it accordingly." Hitting snooze is also just going to make you feel even less well-rested. Explains Tishman, "If your body resumes its sleep cycle after the first alarm, then you may be in a deeper sleep when the second goes off." If you hit snooze four or five times, imagine how tired you'll be. Is It a Bad Idea to Use Your Phone as Your Alarm? Agarwal notes that being dependent on your phone before you go to bed is problematic (the blue light messes with your melatonin levels and triggers your body to be in wake-up mode, the exact opposite effect of what you need pre-slumber), but its inherent use as an alarm device is not. "If you are tempted to use your phone late at night, then I would recommend a traditional alarm clock, but otherwise, the phone is okay too." To keep your sleep rhythm in check, try putting your phone down two hours before you plan to fall asleep, as well as set your phone to airplane mode to whittle down notification disturbances. At Which Time Should You Plan to Set Your Alarm? There's no science to it: Both Agarwal and Tishman agree that the average adult needs seven to nine hours of sleep per night, so mathematically, you'll need to set your alarm for a time that allows you to sleep said hours—if you need to wake up at 7 a.m., plan to fall asleep seven to nine hours before that. If you have trouble falling asleep, this may require you to get into bed an hour or so before that to allow your body and mind to fully unwind. While we're on the subject, doing this each morning will help kick-start your day even further.